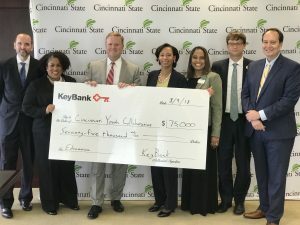 Cincinnati Youth Collaborative, Cincinnati State Technical and Community College, and KeyBank leadership at the check presentation for the “Keys to College Success” program launch. Cincinnati Youth Collaborative, UC Blue Ash, and KeyBank leadership at the check presentation for the “Keys to College Success” program launch. The costs of unexpected circumstances will no longer have to be a barrier for many college students to achieve their dream of receiving a college diploma. The Cincinnati Youth Collaborative (CYC) and the KeyBank Foundation are launching a two-year test and learn program called “Keys to College Success” in order to make discretionary funding available to first generation college students. 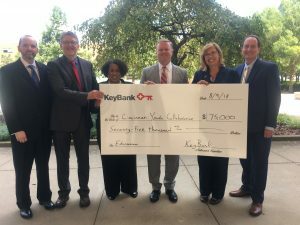 The $75,000 grant from the KeyBank Foundation will serve students who face an urgent financial need that is considered a true “emergency.” Students who, in the absence of such support, would potentially drop out of college. Students who qualify will be eligible for up to $1,500 annually in stipends. Students eligible for this program are involved in CYC’s College Mentoring and Talent Search College and Career advising programs attending the following colleges: Xavier University, University of Cincinnati, University of Cincinnati Blue Ash, Cincinnati State Technical and Community College, Mount St. Joseph University, Northern Kentucky University, Thomas More College, Miami University, University of Dayton, and Wright State University. As part of receiving the funding, students will be required to provide a “sustainability plan” to avoid future issues within their control. They will also be in contact at least once a month with their respective Talent Search Advisor or Mentoring Coordinator.